Zhang Hong still could not believe what she had done. And what she did was giving China its first gold medal ever in women's 1,000m speed skating on Thursday at the Sochi Winter Olympic Games. She was clocked at 1 minute and 14.02 seconds, 0.67 seconds ahead of second-placed Ireen Wust of the Netherlands, while Dutch teammate Margot Boer earned bronze in 1:14.90. It was China's second gold medal of the games. Short track speed skater Li Jianrou won the first gold for China earlier in women's 500m. "I'm very excited now and I haven't accepted the fact that I won the gold," the 25-year-old Zhang said. "I was working hard everyday in the past and I achieved it today. I beat myself." Zhang was so fast that she just missed the Olympic mark set by Chris Witty at the 2002 Salt Lake City Games. Her winning margin of 0.67 was the largest in the women's 1,000 since the 1994 Lillehammer Games. China has been seeking the Olympic gold in speed skating for more than three decades. The country first took part in the Winter Olympics in 1980 in Placid Lake, New York, where China's speed skaters also made their Winter Olympic debut. At the 1992 Albertville Winter Olympic Games in France, Ye Qiaobo won Chinas first Winter Olympic medal, silver in the women's 500 meters. Four days later, in the 1,000m event, Ye won a second silver. Then it took until the 2006 Turin Games 2 years to get another medal, a silver in the 500m race by Wang Manli. And four years later in Vancouver, Wang Beixing claimed a bronze. Breaking the Winter Olympic gold-medal jinx has always been the goal for the Chinese skaters, but the reigning 500m world champion Yu Jing had to withdraw from the Sochi Games at the last minute due to an injury recurrence. 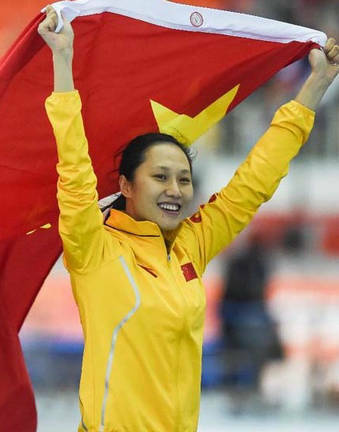 At the 500m event on Tuesday, Zhang narrowly missed reaching the medal podium by finishing fourth, while Wang Beixing, China's biggest hope in the event, finished seventh. With few people expecting Zhang to be a medal contender, her coach remained calm. "Zhang did an excellent job this time," said Feng Qingbo. "It was her best result on a low-altitude track." "Our goal is to finish in the top three but now we have realized the breakthrough of several generations of Chinese speed skaters,'' the coach added. "It's a great honor for us. We are very relaxed now. I expected It was her best result on a low-altitude track." Skating legend Ye also applauded Zhang.